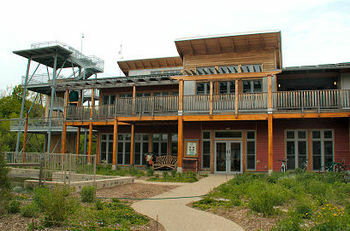 MKEimages.com Image of the Day - The Urban Ecology Center is located at Riverside Park at 1500 E. Park Ave on Milwaukee's lower east side. A huge aquarium, a birdwatching walk, “stream slides”, a rooftop garden, a pond, and lookout tower outside the building are just a few of its features. The mission of The Urban Ecology Center is to educate and inspire people to understand and value nature as motivation for positive change, neighborhood by neighborhood.